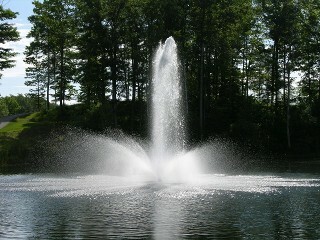 Add beauty and oxygen to your lake or pond with a floating fountain or bottom diffused aeration system. Aquatic Management offers sales and installation of a variety of floating fountains and aeration components. Add a visual feature to your lake while keeping it aerated. We are a distributor of floating fountains from manufacturers such as Otterbine™, AquaMaster®, and Kasco™. When you buy from us, you receive installation and service from factory-trained specialists. Lake Life Guard is a bottom aeration system that utilizes compressed air and submersed diffusers, and is a low-maintenance, economical circulation solution for aerating your lake. We are distributors and offer professional installation and service for all Lake Life Guard systems. Various models are available for installation to improve overall pond health and reduce the risk of summer and winter fish kills. Contact us or call for information and pricing, and request a free evaluation tailored to your lake’s specific needs.